I shall now recite the Narasimha-kavacha, formerly spoken by Prahlada Maharaja . It is most pious, vanquishes all kinds of impediments, and provides one all protection . It bestows upon one all opulences and can give one elevation to the heavenly planets or liberation . 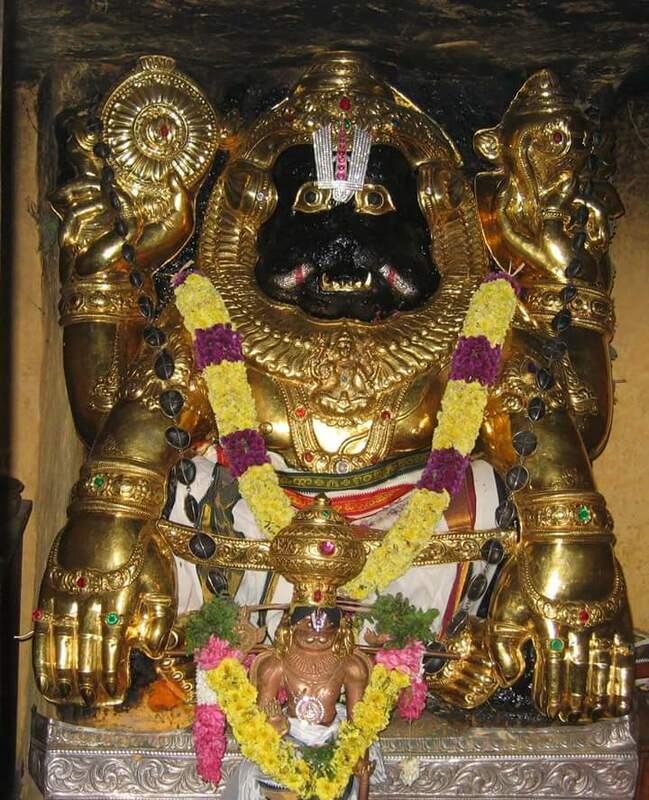 One should meditate on Lord Narasimha, Lord of the universe, seated upon a golden throne . His mouth is wide open, He has three eyes, and He is as radiant as the autumn moon . He is embraced by Lakshmi Devi on his left side, and His form is the shelter of all opulences, both material and spiritual . He is dressed in a spotless yellow garment, which exactly resembles molten gold . He is the original cause of existence, beyond the mundane sphere, for the great demigods headed by Indra . He appears bedecked with rubies which are blazingly effulgent . His two feet are very attractive, and He is armed with various weapons such as the conch, disc, etc . GaruDa joyfully offers prayers with great reverence . मे शिरः पातु लोकरक्षार्थसम्भवः .. ८..
May Lord Narasimha, who protects all the planetary systems, protect my head . Although the Lord is all-pervading, He hid Himself within a pillar . May He protect my speech and the results of my activities . May Lord Narasimha, whose eyes are the sun, and fire, protect my eyes . May Lord Sri Hari, who is pleased by the prayers offered by the best of sages, protect my memory . May He who has the nose of a lion protect my nose, and may He whose face is very dear to the goddess of fortune protect my mouth . 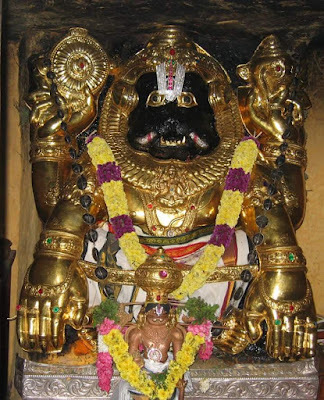 May Lord Narasimha, who is the knower of all sciences, protect my sense of taste . May He whose face is beautiful as the full moon and who is offered prayers by Prahlada Maharaja protect my face . May Lord Narasimha protect my throat . He is the sustainer of the earth and the performer of unlimitedly wonderful activities . May He protect my shoulders . His arms are resplendent with transcendental weapons . May He protect my shoulders . May the Lord, who bestows benedictions upon the demigods, protect my hands, and may He protect me from all sides . May He who is achieved by the perfect yogiis protect my heart, and may Lord Hari protect my dwelling place . नाभिं मे पातु नृहरिः स्वनाभिब्रह्मसंस्तुतः .. १४..
May He who ripped apart the chest and abdomen of the great demon HiraNyaksha protect my waist, and may Lord Narahari protect my navel . He is offered prayers by Lord Brahma, who has sprung from his own navel . May He on whose hips rest all the universes protect my hips . May the Lord protect my private parts . He is the knower of all mantras and all mysteries, but He Himself is not visible . May He who is the original Cupid protect my thighs . May He who exhibits a human-like form protect my knees . May the remover of the burden of the earth, who appears in a form which is half-man and half-lion, protect my calves . May the bestower of heavenly opulence protect my feet . 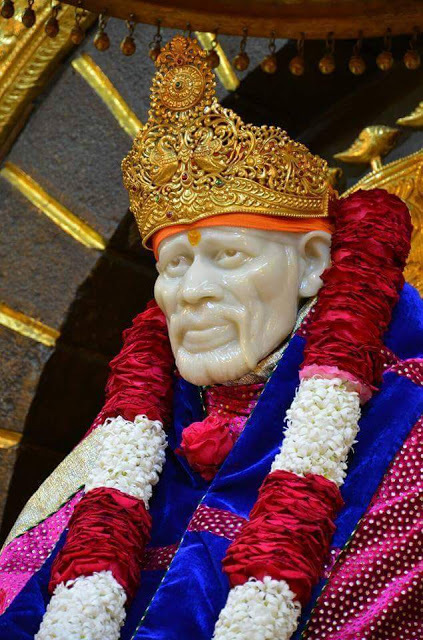 He is the Supreme Controller in the form of a man and lion combined . May the thousand-headed Supreme enjoyer protect my body from all sides and in all respects . May that most ferocious personality protect me from the east . May He who is superior to the greatest heroes protect me from the southeast, which is presided over by Agni . May the Supreme Visnu protect me from the south, and may that person of blazing luster protect me from the southwest . May the Lord of everything protect me from the west . His faces are everywhere, so please may He protect me from this direction . May Lord Narasimha protect me from the northwest, which is predominated by Vayu, and may He whose form is in itself the supreme ornament protect me from the north, where Soma resides . May the all-auspicious Lord, who Himself bestows all-auspiciousness, protect from the northeast, the direction of the sun-god, and may He who is death personified protect me from fear of death and rotation in this material world . This Narasimha-kavacha has been ornamented by issuing from the mouth of Prahlada Maharaja . A devotee who reads this becomes freed from all sins . Whatever one desires in this world he can attain without doubt . One can have wealth, many sons, and a long life . He becomes victorious who desires victory, and indeed becomes a conqueror . He wards off the influence of all planets, earthly, heavenly, and everything in between . One who regularly chants this prayer, whether once or thrice (daily), he becomes victorious whether among demigods, demons, or human beings . One who with purified heart recites this prayer 32,000 times attains the most auspicious of all auspicious things, and material enjoyment and liberation are already understood to be available to such a person . This Kavacha-mantra is the king of all mantras . One attains by it what would be attained by anointing oneself with ashes and chanting all other mantras . Having marked ones body with tilaka, taking achamana with water, and reciting this mantra three times, one will find that the fear of all inauspicious planets is removed . Lord Narasinha roars loudly and causes others to roar . With His multitudes of arms He tears the demons asunder and kills them in this way . He is always seeking out and tormenting the demonic descendants of Diti, both on this earth planet and in the higher planets, and He throws them down and scatters them . He cries with great anger as He destroys the demons in all directions, yet with His unlimited hands He sustains, protects, and nourishes the cosmic manifestation . I offer my respectful obeisances to the Lord, who has assumed the form of a transcendental lion . Thus ends the Narasimha-kavacha as it is described by Prahlada Maharaja in the Brahmanda Purana .